I just finished reading On the Noodle Road: From Beijing to Rome, with Love and Pasta by Jen Lin-Liu. It’s a memoir about her travels on Silk Road across China through Central Asia, Iran, Turkey, and Greece to Italy to discover the origin and development of noodles. I would not recommend it for the writing, but the food descriptions during her journey left me hungry for Middle Eastern flavors. The timing was perfect, as I had dinner plans at Sarma, Ana Sortun’s (of Oleana fame) new restaurant which is “modeled after the traditional meyhanes of Turkey.” Meyhanes are restaurants that focus on serving mezes (small plates) and alcohol. The menu is divided in to Snacks, Meze, Vegetables, Pancakes, Pie & Pide, Sarma and Shish. Additionally, the chef will send out specials on roving platters, dim sum style. They have gotten some acclaim for the fried chicken, which is only offered as a special. We inquired if the chicken would be available that evening, our server answered, “We don’t know, it’s all up to the chef.” He then told us that if there was fried chicken, he would make sure to send the tray in our direction first. Luckily for us, he was true to his word, during our 2 hour meal, trays of fried chicken, deviled eggs, and sautéed mushrooms were offered to us. There were also 2 other selections, but the trays emptied before they got to our table. I found this whole concept annoying; it made it hard to plan our meal, especially since the specials did not seem to come out at regular intervals. The sizes of the plates were also inconsistent; some snacks were large, but some mezes were small. The prices give no indication either; our lamb sliders were the same price as the Brussels sprouts, for twice as much food. We were given warm flatbread, spiced with zaatar accompanied by a beautiful little pitcher of olive oil. 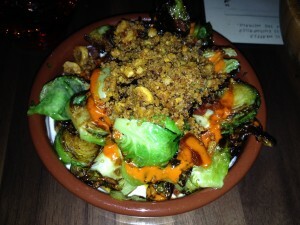 We started with squash fritters ($5), lamb köfte sliders ($10) and Brussels sprouts with chorizo ($10). As we waited for our food, the sesame fried chicken ($10?) tray graced our table, so we pounced on it. 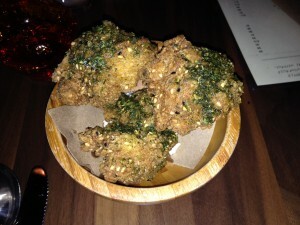 The boneless chicken thigh pieces (3) were heavily spiced with toasted sesame, nigella seeds and dried green harissa. I thought the chicken was quite good and the tahini remoulade was a delicious sauce. The squash fritters were perfect fried cubes; the interior tasted like a vegetable samosa, which had been pureed and thickened. The 3 small cubes were not enough. 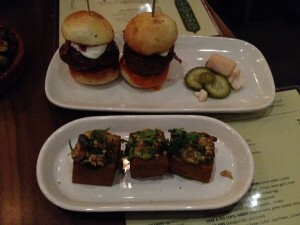 The lamb sliders (2) were excellent. The meatball sized patty had almost a springy texture. They were topped with tomato brown butter and served with delicate pickles of cucumber, turnip and cauliflower florets. I could have polished off three of them for a meal and been very happy. The Brussels sprouts were the biggest disappointment of the night. It was too greasy and salty. We paid an extra $1 for chorizo that just added even more oil to the small dish. At $10, it was highway robbery. We waited for more specials to come out and after 25 minutes, we were offered deviled eggs. We declined and gave up on waiting. 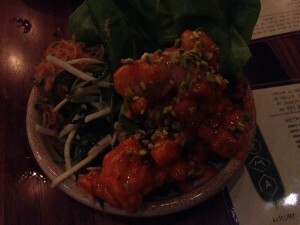 We ordered the Moroccan fried shrimp lettuce wraps ($12), a dish that we spied on a neighboring table. The shrimp were outstanding; tender and crispy. They were served with julienned kohlrabi and rice vermicelli. This was my favorite dish of the night. I had read that the frozen yogurt dessert was small and expensive and the rice pudding was lackluster, but the ricotta loukoumades ($5) caught my eye. Loukoumades are fried dough balls, soaked in sugar syrup, ubiquitous at Greek festivals; My friend Brian is famous for demolishing a dozen and a half all by himself. Loukoumades are not traditionally made with dairy so I was curious as to how the addition of ricotta would work. 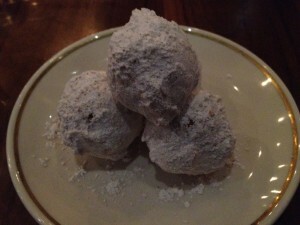 It did not seem like the ricotta added anything - the loukoumades (4) almost the same as the Greek festival treats; the only difference was these were covered in powdered sugar instead of sugar syrup. They were light, crispy and delicious. Leslie declared it her favorite dish of the night. I really enjoyed our meal. I think that Sortun’s food is bold and flavorful; I loved the spices and seasoning. I think that for some it may be too spicy, too salty, too sauced, but for me, it was just right. I wish they would change the structure of the menu, adjust the portion sizes/price accordingly and be more consistent about the roving specials.